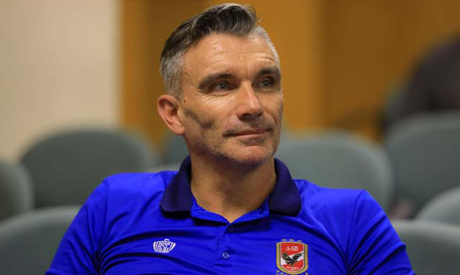 Ahly coach Patrice Carteron said he considers the two legs of the CAF Champions League final against Tunisian side Esperance - on 2 then 9 November - as just "one long game." Ahly will take on the Tunisian side on Friday at Alexandria's Borg El-Arab stadium in the first leg of the continental prestigious tournament, while the second leg is set to be played a week later in Rades, Tunis on 9 November. "I consider the two legs of the final as one game of 180 minutes," the coach said in a press conference on Wednesday. "I don't think of playing the home match and then the away one in Rades separately. I only think that we will play 180 minutes in the African final." the Ahly coach explained. "I have confidence in my players' determination to deliver their best in the two matches," he added. Carteron stressed the importance of the expected sizeable fans' attendance for his team's morale as 42,000 Ahly fans were given the green light to attend Friday's match at Borg El-Arab. "Fans attendance in the first leg will be a good boost for our players to secure the best possible result. I always consider Ahly fans as a partner in our victories. The supporters deserve the best and I promise the team will deliver a strong game," the coach concluded. Ahly, the record eight-time winner of the championship, have reached their second straight CAF Champions League final after defeating Algeria's ES Setif 3-2 on aggregate earlier this month. Meanwhile, Esperance reached the final after passing Angola's Primeiro de Agosto in the semis.